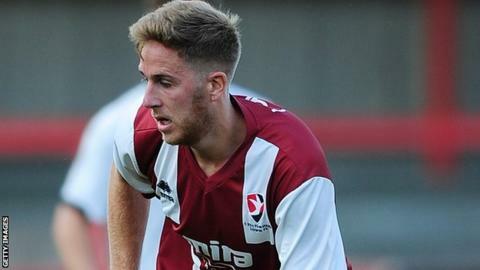 Cheltenham Town midfielder Asa Hall has admitted he considered quitting football after a nightmare year. Hall, 28, sustained a calf injury four minutes into his debut for the club on the first day of last season. An Achilles injury followed but finally he made his comeback against Weston on Saturday, having missed 11 months. "I had some dark times and there were times when I thought of hanging my boots up and never playing again," Hall told BBC Radio Gloucestershire. "It was that frustrating. The pain barrier - I couldn't get through it, it was dark. People around me were positive, the physio was great and said it would be OK and he was right. "I had oxygen chambers, blood injections, scans and x-rays and they only spotted at Christmas that the tendon had attached itself to the Achilles and needed pulling out. The doctors said it was an odd one to get." Hall was delighted to have made his comeback at the weekend and, having seen the club relegated last season, is relishing helping them get back into the Football League. "It was a great feeling, a shock to the system," he said. "It's been a long 11 months and it's great to be back out there with the lads. "It was very strange, and very frustrating, and I'm so glad to have it behind me."